By participating in #shopindiesfirstsweepstakes (the “Sweepstakes”), each participant unconditionally accepts and agrees to comply with and abide by these Official Rules and the decisions of the American Booksellers Association, 333 Westchester Ave., Suite S202, White Plains, NY 10604 (the “Sponsor”), which shall be final and binding in all respects. SWEEPSTAKES ENTRY PERIOD: The Sweepstakes begins at 12:00:01AM Eastern Time (“ET”) on November 15, 2017 and ends at 11:59:59 PM ET on November 26, 2017 (the “Sweepstakes Period”). ELIGIBILITY: The Sweepstakes is open to legal residents of the United States, including the District of Columbia, thirteen (13) years of age and older. Entrants on Instagram must have a public Instagram profile. Void outside the U.S. and wherever prohibited or restricted by law. Employees of Sponsor, its promotional partner Penguin Random House (“PRH”), and their respective subsidiaries, affiliates, advertising and promotion agencies, and the immediate family members of, and/or those living in the same household of each (collectively “Sweepstakes Entities”), are not eligible to enter. Sweepstakes is subject to all applicable federal, state and local laws and regulations. 1) Post a message on social platforms Twitter and/or Instagram using the hashtag #shopindiesfirstsweepstakes together with the store handle of a U.S. independent bookstore. Example: “#shopindiesfirstsweepstakes @happybooks"
2) Post a message on social platforms Twitter and/or Instagram using the hashtag #shopindiesfirstsweepstakes together with the name, city, and state of a U.S. independent bookstore. Example: “#shopindiesfirstsweepstakes Happy Books in Paramus, NJ"
3) Post a message on social platforms Twitter and/or Instagram using the hashtag #shopindiesfirstsweepstakes and include a store location tag in the post. Free Twitter accounts are available at www.twitter.com, and free Instagram app download to your web-enabled mobile device is available via www.instagram.com. In addition to compliance with these Official Rules, participation via Twitter or Instagram must also comply with the terms of service of the applicable social media platform (https://twitter.com/tos, and/or www.instagram.com/about/legal/terms, as applicable). Further, note your entry will not be considered successfully submitted if your Twitter or Instagram account settings prevent Sponsor from seeing your entry. Any attempt by a person to use multiple accounts or identities to gain more entries than permitted by these Official Rules shall result in disqualification at the discretion of the Sponsor. Multiple entrants are not permitted to share the same email address or social media account. Proof of submission of entry does not constitute proof of receipt of entry. In the event of a dispute as to the identity of the entrant associated with any entry, the authorized account holder of the social media account associated with the entry at time of submission, will be deemed to be the entrant. The “authorized account holder” is the natural person assigned to the social media account by the applicable social media platform. Potential winners may be required to show proof of being the authorized account holder. Normal Internet access and usage charges imposed by your online service will apply. If you participate from your mobile phone, such activity will be subject to the charges pursuant to your wireless service provider’s rate plan. You further understand that by participating via mobile phone, if you are a potential winner, the Sponsor may contact you via mobile phone, which will be subject to the charges pursuant to your wireless service provider’s rate plan. Please consult your wireless service provider for more information. RANDOM DRAWING/PRIZES/ODDS OF WINNING: On or about December 15, 2017, a random drawing will be conducted by representatives of the Sponsor from among all eligible entries received to award Five (5) Grand Prizes, each consisting of one thousand dollars ($1,000) worth of books. 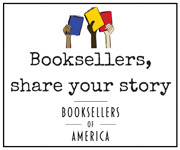 Additionally, the independent bookstores named in the winning posts will receive one thousand dollars ($1,000) worth of books to be donated to a local 501(c)(3) tax-exempt charitable organization chosen by the independent bookstore and approved by PRH. The total approximate retail value of all prizes is $10,000. All prizes are provided courtesy of PRH, 1745 Broadway, New York, NY, 10019. PRH will fulfill the prize awards directly with the five (5) Grand Prize winners and the charitable groups chosen by the five (5) independent bookstores named in the winning posts. Odds of winning will depend upon the total number of eligible entries received. WINNER NOTIFICATION AND PRIZE RESTRICTIONS: Each potential winner will be notified via a social media message or comment on the social media platform used to submit the winning entry, to verify his/her eligibility and ability to accept the prize, and to obtain his/her complete contact information. It is recommended that Twitter and Instagram entrants confirm that their social media notification settings are turned on, such that they would be notified in a timely fashion of Sponsor’s attempt to contact them via the applicable social media platform. In particular, if the potential winner entered via Twitter, he/she will be notified by direct message and must allow for Sponsor to contact him/her via direct message. Any such message or comment will instruct the potential winner to reply within three (3) business days after the time that the notification message or comment was sent/posted. Potential winners must reply as instructed to identify themselves, confirm their eligibility and ability to accept the prize, and provide their complete contact information within such three (3) business day period, or he/she will be disqualified. In Sponsor’s sole discretion, a potential winner may only be notified one time as set forth above for attempted prize notification. Potential winners will subsequently be required to complete a notarized affidavit of eligibility, a liability release, and (where legal) a publicity release, which must be returned within the time period specified by Sponsor at the time of such request. Potential winners will also be required to return a properly completed IRS W-9 form within the time period specified by Sponsor, and such winner will receive an IRS Form 1099 issued in their name for the actual value of prizes received. If a potential winner is a minor in his/her state of residence, that minor's parent/legal guardian must co-sign any affidavit or other prize claim agreements. All taxes (including without limitation Federal, state and local taxes) in connection with a prize, and the reporting consequence thereof, are the sole responsibility of the applicable winner. Sponsor makes no representations regarding the tax liability associated with any prize. Proof of identity, age, and legal residence may be required to claim a prize. Any winner or potential winner may be disqualified in Sponsor’s sole discretion if: (a) he/she fails to reply or to provide any required information or properly completed documents within the required time period; (b) he/she fails to comply with any of the terms of these Official Rules; or (c) if any prize or prize notification is returned as undeliverable. In the event of disqualification of a winner, at Sponsor’s sole discretion the prize may be awarded to an alternate winner selected from among the remaining applicable eligible entries via the means of winner determination described herein, pending verification of eligibility. No responsibility is assumed by Sponsor for any incorrect or missing social media account information associated with an entry, or any change of social media account of entrant after entry submission. Any prize details not specified will be determined by Sponsor in its sole discretion. No prize transfer. Unless otherwise specified herein, no prize substitution except at Sponsor’s sole discretion due to unavailability, in which case a prize of comparable or greater value will be awarded. GENERAL RULES: By participating, entrants agree (a) to release, discharge and hold harmless Sweepstakes Entities, Twitter, and Instagram from any and all injuries, liability, losses and damages of any kind resulting from their participation in the Sweepstakes or their acceptance, use or misuse of prize including, without limitation, personal injury, death and property damage; and if a winner, (b) to permit Sweepstakes Entities to use his or her name, photograph, likeness, statements, biographical information, voice, voice likeness and city and state address for advertising, publicity and promotional purposes in all media, in perpetuity, without compensation (unless prohibited by law) and agree to execute specific consent to such use upon request. Entrants further agree that the Sweepstakes Entities are not responsible for the following: (a) electronic transmissions, entries or submissions that are late, incomplete, inaudible, illegible, damaged, garbled, destroyed, misdirected or not received by Sponsor or its agents for any reason; (b) any problems or technical malfunctions, errors, omissions, interruptions, deletions, defects, delays in operation or transmission, communication failures and/or human error that may occur in the transmission, receipt or processing of entries or related materials; or for destruction of or unauthorized access to, or alteration of entries or related material; (c) failed or unavailable hardware, network, software or telephone transmissions, damage to entrants' or any person's computer and/or its contents related to or resulting from participation in this Sweepstakes; (d) causes beyond Sponsor's reasonable control that jeopardize the administration, security, fairness, integrity or proper conduct of this Sweepstakes; (e) any entries submitted in a manner that is not expressly allowed under these rules (all such entries will be disqualified); or (f) any printing errors in these Official Rules or in any advertisements or correspondence in connection with this Sweepstakes. In the event of any conflict between these Official Rules and any abbreviated rules or advertising distributed relating to the Sweepstakes, the terms and conditions of these Official Rules shall prevail. Sponsor reserves the right, in its sole discretion, to modify, cancel or suspend this Sweepstakes should virus, bugs, fraud, hacking or other causes beyond the control of the Sponsor corrupt the administration, security or proper play of the Sweepstakes. In such cases, winners will be determined from all eligible entries received prior to cancellation. The use of any automated launching or entry software or any other mechanical or electronic means that permits the participant to automatically enter repeatedly is prohibited. In the event of a dispute as to the identity of an entrant based on an e-mail address, the entry in question may be disqualified at the sole discretion of the Administrator and/or Sponsor. Sponsor reserves the right to prohibit the participation of an individual if fraud or tampering is suspected or if the individual fails to comply with any requirement of participation as stated herein or with any provision in these Official Rules. DISPUTES: Except where prohibited, entrant agrees that any and all disputes, claims and causes of action arising out of, or connected with, the Sweepstakes or any prize awarded shall be resolved individually, without resort to any form of class action, and exclusively by the appropriate court located in the state of New York. All issues and questions concerning the construction, validity, interpretation and enforceability of these Official Rules, entrant’s rights and obligations, or the rights and obligations of the Sponsor in connection with the Sweepstakes, shall be governed by, and construed in accordance with, the laws of the state of New York without giving effect to any choice of law or conflict of law rules which would cause the application of the laws of any jurisdiction other than the state of New York. The remedy for any claim shall be limited to actual damages, and in no event shall any party be entitled to recover punitive, exemplary, consequential, or incidental damages, including attorney’s fees or other such related costs of bringing a claim, or to rescind this agreement or seek injunctive or any other equitable relief. THE PARTIES HEREBY WAIVE THEIR RIGHT TO JURY TRIAL WITH RESPECT TO ALL CLAIMS AND ISSUES ARISING OUT OF OR RELATING TO THIS PROMOTION WHETHER SOUNDING IN CONTRACT OR TORT, AND INCLUDING ANY CLAIM FOR FRAUDULENT INDUCEMENT THEREOF. COLLECTION AND USE OF PERSONAL INFORMATION: Information submitted in connection with the Sweepstakes will be treated in accordance with these Official Rules. By entering the Sweepstakes, you agree that Sponsor may share your personal information with the Promotion Parties for the purpose of winner verification in the event that you are chosen as a potential winner. WINNER LIST: To receive a list of winners, send a stamped, self-addressed envelope to: American Booksellers Association, 333 Westchester Ave., Suite S202, White Plains, NY 10604, attn. #shopindiesfirstsweepstakes within sixty (60) days of expiration of the Sweepstakes Period.